The Evenks were formerly known as tungus. This designation was spread by the Russians, who acquired it from the Yakuts and the Siberian Tatars (in the Yakut language tongus) in the 17th century. The Evenks have several self-designations of which the best known is even, evenk. This became the official designation for the people in 1931. Some groups call themselves orochen 'an inhabitant of the River Oro', orochon 'a rearer of reindeer', ile 'a human being', etc. At one time or another tribal designations and place -- names have also been used as self-designations, for instance, manjagir, birachen, solon etc. Several of these have even been taken for separate ethnic entities. The Evens or Lamuts receive a separate mention, because though originally close to the Evenks, they are now considered to be a different people. The Evenks inhabit a huge territory of the Siberian taiga from the River Ob in the west to the Okhotsk Sea in the east, and from the Arctic Ocean in the north, to Manchuria and Sakhalin in the south. The total area of their habitat is about 2.5 million square kilometres. In all of the Russia only the Russians inhabit a larger territory. According to the administrative structure, the Evenks inhabit, amonst others, the Tyumen and Tomsk regions, the Krasnoyarsky Krai, the Irkutsk, Chita, and Amur regions, Buryatia and Yakutia, the Khabarovsky Krai and the Sakhalin region. Anthropologically the Evenk belong to the Baikal or Paleo-Siberian group of the Mongolian type, originating from the ancient Paleo-Siberian people of the Enisei up to the Okhotskoe Sea. The Evenk language is the largest of the northern group of the Manchu-Tungus languages, a group which also includes the Even and Negidal languages. The basic vocabulary has much in common with the Mongolian and the Turkic languages, indicating a close relation. In certain areas the influences of the Yakut and the Buryat languages are strong. The influence of Russian is general and overwhelming (in 1979, 75.2 % of the Evenk were fluent in Russian). The Evenk language varies considerably and is divided into three large dialect groups: the northern, the southern and the eastern dialect. These are further divided into minor dialects. The written language was created in the late 1920s. The original home of the Evenk was situated in the vicinity of Lake Baikal, where the ancient Tungusic groups have their origins. The anthropological type, characteristic of the Evenk, is discernible in the early neolithic people on the shores of the Baikal. The ancestors of the Evenk also seem to have close contacts with the southern tribes which spoke Mongolian and Turkic languages. From the Baikal the Tungus began to migrate to the east, to the Amur and the coast of the Okhotsk Sea, to the north, to the river basin of the Lena, and to the northwest, to the river basin of the Yenisey. They moved up to the tundra in the north, and the steppes in the south. One of the reasons for such a migration might have been pressure from the Turkic tribes in the Baikal area at the beginning of the first millennium. Any Paleo-Asiatic tribes, met on the way, were assimilated or forced to retreat. In the southern areas the Evenks were under the influence of the Mongols, and came to be known as the 'Horse-Tungus'. Gradually two large groups of Evenks were formed: the northern Evenks, who were hunters and reared reindeer, and the southern Evenks, who bred cattle and horses and, to some extent, cultivated land. The Evenks inhabited areas of a similar environment: mountain taiga and, to a lesser degree, mountain tundra. The Evenks have been the only Northern people to occupy mountainous areas of taiga. Their economy was based on hunting and rearing reindeer, which allowed for the Evenks' exceptional rate of expansion. Their whole traditional culture supported this mobile way of living: they had light conical tents, excellent skis, and light clothing. 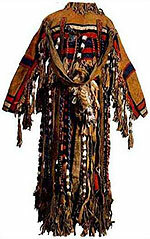 This mode of life and its associated objects, forms the so-called Tungus culture. According to some, it was the domestication of reindeer that enabled the Evenks to become extremely mobile. The history of the Evenks' habitation can be traced in detail from the 17th century on. At that time the Evenks left several of their previous territories, for instance, the River Angara, when the Yakut, the Buryat and the Russians appeared in the province. The Evenks had especially bad relations with the Yakuts, who had settled in the river basin of the Lena in the 13th century. In the 18th and 19th centuries the Evenks living there adopted the Yakut language. In the Baikal area the Evenks began to speak the Buryat and the Mongolian languages, and even converted to lamaism. The southern Evenk - the Manegir, the Birar, the Solon - were influenced by the Manchu, Daur and Chinese cultures. The arable lands in Siberia were occupied by Russian settlers, migrating there in the 17th century, and those Evenks, living in the vicinity on the upper reaches of the Lena and near Baikal, were russified. In the 19th century the Evenks appeared on the lower reaches of the Amur and Sakhalin, and, later, on the Chukchi Peninsula. The 'Horse-Evenk', the Manegir and the Birar moved to Manchuria. A number of the Evenks migrated west of the Yenisey. In this case, the movement of the Evenk was caused initially by the pressure of their southern neighbours, but the coming of the Russians, a search for better hunting grounds and the need to escape a scourge of epidemics, were also important factors. At the demants of the Russian tsarist government, Cossack regiments, consisting of the Horse-Evenk and the Buryat were formed to the east of Baikal. These Cossacks were used as borderguards. Later they were assimilated by the Russians and the Buryat and a separate ethnic group of Russians - the Baikal Cossacks - came into being. In 1897 their number was 3,045. In addition, 319 Evenks were raised to the ranks of nobility. The life of the Evenks in the taiga was based on winter hunting and summer fishing and their nomadic way of life harmonized with this cycle. Reindeer breeding was central to the existence of the Evenks. Domesticated reindeer were the most important draught and riding animals, and success in hunting was dependent on the existence of reindeer in a family. The Evenk fishermen at the Okhotsk Sea did not breed reindeer, and the Evenks living beyond Baikal bred horses, camels and sheep instead. They travelled only twice a year -- in winter to the mountains and in summer to the steppes. In several locations on the Angara, on the upper reaches of the Lena and on the tributaries of the Amur the Evenks were successful in cultivating land (they grew vegetables, and tobacco). There were also several other activities indulged in by the Evenks, however, none ever supplanted hunting. As the Evenks moved over an exceptionally large territory, they met various peoples and had to cope with different natural conditions. As a result, they often had to make changes in their way of life; giving up reindeer rearing, for instance. In several instances, in the 18th and 19th centuries, the Evenks developed new languages. The ethnic area of the Evenk has constantly narrowed, one of the reasons being assimilation. However, they have still maintained the Tungus culture marking the Evenk as different from all other Northern peoples.